When even a DIY article from 1937 peppers it’s instructions with warnings, it’s probably best to be very careful. Editor’s Note—This equipment is particularly suited for science class-room demonstrations. At no time should a demonstration be attempted by one unfamiliar with the apparatus. Although the giant brush discharge is harmless to the average person, a shock from any part of the equipment other than the high-frequency transformer will carry with it serious consequences to the person involved. It is suggested that when this apparatus is demonstrated before a group of persons, they be warned not to touch the apparatus and to stand a respectful distance from the low-voltage equipment. THE apparatus about to be described is capable of throwing a spark four and a half feet long. In spite of its deadly appearance, this spark is quite harmless. The operator may hold a metal rod in his hand and let it jump to the end of the rod and run through his body to ground, not only without harm, but without any sensation of shock. A rather spectacular stunt is to hold one wire leading to an incandescent light, and bring the other end near the coil. The lamp will be lighted by the current passing through the body and may in a few minutes even be burned out. A mystifying trick is to hold a short length of neon tube in one’s hand, and approach the coil. Long before there is any sign of a spark jumping to the tube, it will light with its characteristic glow. Many interesting experiments can be performed from an insulated platform. Since the spark jumps to grounded objects, if one stands on a board supported by glass insulators (milk bottles will do temporarily) and touches the discharge ball with a metal rod, sparks may be drawn from one’s body by anyone standing on the ground. Care must be taken not to draw sparks from the bare skin, as they might cause a blister. A finger ring, or even a spoon in the mouth, can be used as good contacts from which to draw the spark. A peculiar and weird effect can be had, when one is so charged, by raising the free hand above the head in a darkened room. The person will then be dimly seen outlined by a purple discharge. Small flames will dart from the raised hand, hair, and even from the tips of the ears. Perhaps the most awe-inspiring spectacle is the coil operating under full power in a dark room. Long streamers of purple fire dart out in all directions from the discharge ball, emitting at the same time an almost deafening noise. A grounded wire is now slowly moved towards the discharge ball. The streamers change their direction and snap at the wire. Suddenly a heavy spark bridges the gap, and the air becomes thick with ozone. Many experiments can be performed with this apparatus, and this short sketch gives an idea of some of them. Before beginning the actual construction of the device, it is well to know something of the principle involved. Briefly, it is this: as the frequency of an alternating, high voltage current rises, it loses many of its normal characteristics. At extremely high frequencies it is almost a totally different kind of electricity. It produces no sensation of the shock when taken through the body, because as the frequency becomes higher, the path of travel becomes closer to the surface. At extremely high frequencies this path of travel is so close to the surface that it does not touch the nerves. This is known as “skin affect,” It has a tendancy to diffuse off the conductor into the air, causing the beautiful brush discharges often seen on insulated wires. This also accounts for the lighting of neon tubes without wire connection. The current refuses to be stopped by nearly all insulators, oil being one of the few insulators having some protective qualities. In order to produce a current of this nature, four distinct pieces of apparatus are necessary. They are: a low-frequency transformer which converts the low voltage current from the lighting circuit into high voltage current suitable for charging the condenser; a condenser which is composed of alternate sheets of metal and glass; a spark gap which consists of two electrodes separated by air; and a high frequency transformer. The low frequency transformer should have an output of 3,000 to 5,000 volts. The transformer is of the magnetic leakage type such as used for radio purposes. Since the construction of a transformer of this size embodies considerable difficulties, the reader should, if possible, obtain one already constructed. A power line transformer may be converted into one of the magnetic leakage type at little trouble or expense. A small transformer, such as is put on poles to step down current from 5,000 volts to 110 or 220, can undoubtably be purchased from an electrical junk-yard or direct from the local power company at a very reasonable cost. The power drawn by the unaltered transformer probably will be too large, but this need cause no worry as it may be reduced by the choke about to be described. The choke consists of 510 turns of No. 10 D. C. C. copper magnet wire. This coil is wound in four layers on a bakelite tube 16 inches long and two inches in diameter. To wind the coil, lightly force two square blocks into the ends of the tube and mount it in a lathe. In the absence of a lathe one can easily construct a coil winder to be turned by hand or a foot treadle. Shellac the tube and cover it with a layer of waxed paper. Then begin winding the coil 1/2-inch from the end of the tube to the other end, leaving the same margin. After completing the first winding, cover the layer with six sheets of waxed paper and wind back to the starting end. Solder a tap of wire to the last turn of this layer, cover as before with waxed paper, and wind another layer. This layer also should be tapped and insulated with waxed paper. The last layer is wound to within 1 inch of the end and the wire anchored to the coil with friction tape. The completed coil is now covered with ten sheets of waxed paper and liberally soaked with shellac. -The tube to contain the core should he small enough to slip in and out of the coil easily. It is packed with soft iron wire of No. 20 gauge and the ends trimmed to make a smooth job. About ten pounds will be needed for the core. By using the taps to vary the number of turns and by sliding the core back and forth in the coil, the value of reactance is readily changed. If the reactance is not sufficient to prevent “blowing” of fuses, wind another layer of No. 14 wire on the coil. The reactance coil is connected in series with the primary of the low frequency transformer, as shown in the diagram. The purpose of the condenser is to store the high voltage current momentarily. When sufficient energy charge is stored it discharges across the spark gap. While this discharge may seem to be only one continuous spark, it is in reality thousands of discharges first in one direction and then in the other. No sooner does the potential fall to a low value than the condenser is recharged, starting the cycle of operations all over again. By this process the frequency is raised to the required point. The condenser is made from glass plates, sheets of tin foil and copper ribbon for tab connections. The glass plates can be bought from a photographer already cut 8×10 inches and are preferable to window glass because they are free from bubbles and other imperfections. To clean them they should be soaked in hot water and then scoured to remove the emulsion. To make the condenser, 132 plates will be required. It might be well to have a few extra in case some are broken or prove defective. Sixty of the cleaned plates are now covered in the center on both sides with heavy tin foil cut 6×8 inches. This tin foil may be purchased from wholesale hardware dealers in rolls a foot wide. As is readily seen, 40 feet will be needed. If it cannot be obtained in this form, a florist might be able to supply it in sheets. To fix the tin foil in place, the plates are heated in an oven, rubbed with a cake of beeswax, and the tin-foil sheet pressed on the center so as to leave a margin of one inch on each edge. Both sides of the plates are covered in this manner. Any ridges or wrinkles in the foil should be pressed out by rubbing gently from the center with a wad of cloth. Copper strips of an inch wide and three inches long are soldered to the upper left hand corner of each sheet of tin-foil after which the condenser is ready for assembling. First a plate without tin foil is taken, then a plate prepared with the foil is placed 011 top of it, then another clean one is placed on top of the prepared plate. These plates are stacked together until five of the prepared plates have been used. A clean plate is then placed on top of the pile to act as a cover. The unit is then bound with friction tape to prevent the plates from separating during the insulating process. When all the plates have been used there will be 12 units ready for insulating. The first method of insulating is perhaps the best if it be not desirable to move the condenser very much. It consists of submerging the entire condenser in a tank of transformer oil. If this is done be sure that the wires from the individual units are above the surface of the liquid. The other method of insulating consists of dipping the edges of each unit to a depth of two inches in a hot mixture consisting of equal weights of beeswax and rosin. We now come to the construction of the spark gap. This consists essentially of a fan motor turning a copper or steel disc, slotted as shown on page 94. The discharge electrodes are placed on either side of this disc so that when it revolves new faces are constantly being presented to the spark. This not only keeps the metal from oxidizing but constantly circulates a current of fresh cool air between the electrodes. The motor for this gap may be of any convenient size. An old fan motor is best as it uses little current and has a fairly high operating speed. The rotating disc should be at least 3/8-inch thick and 10 inches square. After finding the center of the piece of metal, a circle of 10 inch diameter is drawn, then one of 9 inches and finally one of 3-inch diameter. The metal plate is next mounted on a wooden faceplate in the lathe and a cut taken through the metal on the 3-inch circle and a similar cut taken on the 10-inch circle. The disc should now be divided with 24 radial lines running from the center and crossing the edge at 24 equidistant points. Since the radius of a circle is equal to 1/6 the circumference, the 9-inch circle can easily be divided into six parts with a compass, each of these parts cut in half and then each part once more halved making 24 equal parts. Alternate segments between the 9-inch circle and the edge are removed. This is best done by cutting the two edges down as far as the circle and then breaking off the fragment. This is entirely permissabe since the bottom of the cut does not have to be smooth. To insulate the motor from the high tension current, the disc is mounted on an insulating hub, which in turn is fastened to the motor shaft. The disc is placed on the fibre and six holes drilled around the edge of the fibre and on through the metal. The two are then bolted or riveted together. The motor with the completed rotating disc mounted on the shaft should be bolted to a suitable base. Opposite the edges of the disc screw a piece of fibre 1/4-inch thick, 1-inch wide and high enough to extend an inch above the motor shaft. These form the supports for the stationary electrodes. The electrodes are made of brass and ground or filed slightly concave to fit the curve of the disc. The •side opposite the concave face of each electrode is drilled and threaded upon a 5/16 inch brass rod which in turn passes through 3/8-inch holes drilled in the fibre supports in such a position that the electrodes are nearly level with the motor shaft. Strips of heavy copper ribbon are soldered to the brass rods and establish connection with binding posts placed a few inches beneath the rods on the fibre supports. We now come to the final piece of apparatus and perhaps the most difficult to construct, the high frequency transformer. This transformer consists essentially of a large cylinder upon which wire is wound in a single layer for the secondary coil with a flat spiral of copper or brass ribbon about the base to act as the primary. Because it deals with high frequency electricity, no metal core is necessary. The cylinder for the secondary is 53 inches high and 15 inches in diameter. It is constructed without the use of nails throughout for nails will cause considerable loss in current due to brush leakage. The cylinder is formed on three plywood discs 14-1/2 inches in diameter from mounting board or strips of wood 1/2-inch wide, 1/4 -inch thick and 53 inches long. The strips are placed side by side and as close together as possible. When the entire circumference has been covered you should have a solid, well constructed, wooden cylinder. It should now be shellacked and covered with a layer of wrapping paper. This serves to remove the rough edges left by the strips. The winding on the secondary consists of 700 turns of No. 22 I). C. C. copper magnet wire, with the turns spaced 14 to the inch. This will amount to about 2.670 feet or 5.2 pounds of wire. To wind the coil pass a metal rod through the cylinder and mount it between two saw-horses. Before winding the wire on the cylinder, glue a band of one inch copper ribbon around the cylinder, one inch from the top and another placed three inches from the bottom. The bands should not meet, a space of about one inch being left between ends. Solder one end of the wire to the top band and start winding. The spacing between turns may be obtained by winding heavy cord alongside of the wire. Shellac liberally applied will hold the turns in place. The discharge ball is of metal and about 5 inches in diameter, mounted on top of the coil. A toilet tank float will serve the purpose very well. Complete the secondary coil by connecting a wire between the metal ball and the top of the coil. The primary coil is wound with copper or brass ribbon 1-1/2 inches wide in the form of a flat spiral. About 53 feet of the ribbon for the 21-inch outer diameter of the 10-turn spiral winding will be required. The primary supports consist of 8 pieces of fibre 8-1/2 inches long, 2 inches wide and 1 inch thick. The four top pieces have a section cut away as in the drawing so as to keep the coil from spreading. Holes are drilled in these pieces, H of an inch from the ends, large enough to permit the passage of six inch bolts. The primary coil is mounted on a wooden base 37 inches in diameter with the four fibre pieces to support the primary located so that the primary will be in the center of the board. The supports are then bolted to the base, thus holding the primary securely in place. Mount the secondary inside the primary coil on a wooden base 16 inches square, supported on four wooden blocks. Place the blocks so they rest flush with the edges at the corners of the board, and drill holes for a good sized bolt to pass through each corner of the board for mounting the secondary coil to the base. A piece of copper ribbon is soldered to the inside turn of the primary coil, and to the bottom of the secondary, winding, completing the coil construction. The apparatus is now ready for connecting and operating. The wires are connected according to the diagram. For the sake of simplicity the rotating disc is omitted in the diagram of the spark gap. The spark gap motor is of course connected to the input line through a suitable switch. The wire from the secondary of the low frequency transformer is automotive high tension wire; that from the condenser should he special, heavily insulated neon sign cable, as should that also from the spark gap. GREAT CARE MUST BE TAKEN NEVER TO TOUCH THE LOW FREQUENCY TRANSFORMER. The condenser when charged will retain a considerable quantity of electricity for days, so it is well to “short” the connections for a second (with a well insulated metal rod) before touching them. The grounded connections may be of braided ribbon or other heavy uninsulated wire connected to a water pipe. This ground should be a water pipe, never a gas pipe. Under no circumstances should the coil be operated unless this ground is established. The coil is now ready to be set in operation. Clip the wires from the condenser and the spark gap to convenient turns of the primary of the high frequency transformer, start the spark gap motor, and turn on the power. A loud crackling noise should be heard and streamers of fire seen darting from the discharge ball. Vary the number and position of the turns used in the primary of the high frequency transformer and perhaps alter the capacity of the condenser until maximum output is obtained. Be sure that all power is shut off when these adjustments are made, and discharge the condensers as mentioned above before touching anything metallic. Am I reading that right? A 5000 volt secondary is feeding a 70:1 transformer? So, 350,000 volts? I hope that’s a DAMNED high frequency! @Toronto: Notice the motorized spark gap – that’s your oscillator. It has 12 teeth, so depending on the RPM of the motor, it should have a fairly high frequency. Still – you wouldn’t want to come into contact with the primary of the Oudin coil itself. These kinds of coils are anything but safe if you don’t know what you’re doing (and even when you do, you still need to exercise extreme caution around them). 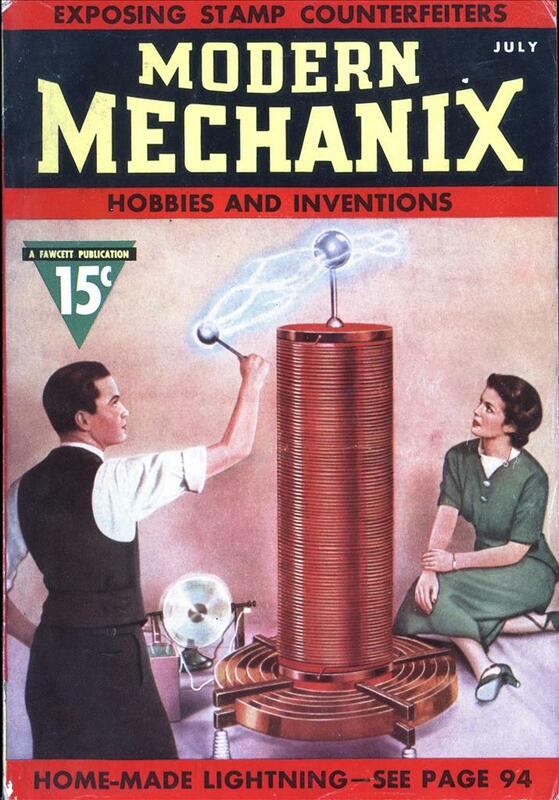 In 1968 a young friend wanted high voltage source for an X-Ray project for a junior high school science fair. 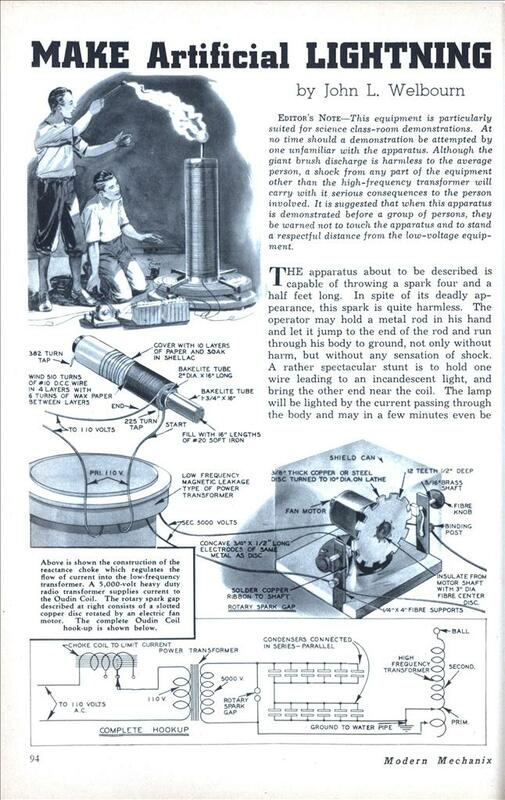 The plans in “The Amateur Scientist” column in Scientific American used the output of a Model-T spark coil feeding an Oudin coil. Not having ready access to either part, we substituted a 10,000 volt neon sign transformer and fed the output of it into a voltage quadrupler circuit using TV 1B3 high voltage rectifier tubes and doorknob capacitors. We solved much of the insulation problem by using a sheet of glass for a chassis and lots of “Red Glypt” corona dope. It was quite spectacular watching it hissing, sparking, and popping in a darkened room. One dry day it arced with a very loud bang and essentially blew itself up. He never dared connect the X-Ray tube, the 1B3’s probably put out enough on their own.